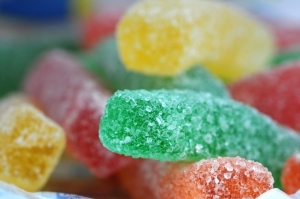 Live For Food » Blog Archive » We need glucose for energy – so why not eat sugar? We need glucose for energy – so why not eat sugar? I have already talked about how the body breaks down the carbohydrates we eat into glucose molecules, and as we know, glucose is a type of sugar. The body then transports the glucose to its many cells where it is used as energy in carrying out bodily functions and movements. So the question that comes to mind is that if the body needs glucose to function, what is so bad about eating sugar and sugary products? Surely we are doing the body a favor by giving it much needed energy? When we eat carbohydrates of any kind the body breaks these down into glucose molecules in the intestine. The glucose is taken into the bloodstream and transported to the cells. Blood sugar levels refer to the amount of glucose currently in the bloodstream. The pancreas notices what the blood sugar levels are. If the levels are high, i.e. lots of glucose in the blood, the pancreas release a hormone called insulin. Insulin allows the cells to absorb the glucose from the blood, thus reducing blood sugar levels. Then the pancreas detects the blood sugar levels are back to normal and stop producing insulin. What happens when the cells are full of glucose? Insulin helps to store any excess glucose. First it is stored as glycogen in the liver and muscles. Glycogen can be easily used as energy when the glucose in the cells runs out. Any further excess glucose is stored as fat. Fat can also be used as energy but only as a last resort once the glucose and glycogen run out. If we eat simple sugars like table sugar or cakes and sweets containing sugar, the body doesn’t have to work very hard to break the food down into glucose molecules. Consequently a large amount of glucose immediately goes into the bloodstream, making the blood sugar levels very high. The pancreas goes into overdrive and releases loads of insulin. There is far more glucose than the body needs immediately so the excess is stored as glycogen and then as fat. Because there is such a lot of insulin it takes all the glucose out of the blood. This results in very low blood sugar levels. Low blood sugar levels can give you fatigue and that post lunch afternoon slump, and make you hungry again. If you then eat something else sugary the cycle starts again. Eating sugar doesn’t fill you up for long – it justs leads you into eating more and more sugar. The extreme of this reaction is when the body becomes resistant to insulin. This can happen if you constantly consume sugar. More and more insulin is needed to lower the blood sugar levels. This can lead to diabetes. So what about complex carbohydrates? Now we can see why it is better to eat complex carbohydrates like bread, pasta, rice and vegetables, than simple carbohydrates like sugar. The body has to work harder to break down the carbohydrates into glucose. The breakdown is also slowed by the high fibre content of some complex carbohydrates, and also by the processing of nutrients which are not present in simple carbohydrates. Glucose is released into the bloodstream more slowly. The blood and cells receive a more steady flow of glucose. Insulin production is regulated more effectively. Fewer highs and lows in blood sugar levels will make you feel better and more energized, and will keep you feeling full for longer. Excessive intake of complex carbohydrates will still however result in the excess glucose being stored as fat. Complex carbohydrates are better for your digestion and weight than simple carbohydrates. If your portion sizes of carbohydrates are consistently too large you will gain fat, regardless of the type of carbohydrates. The type of carbohydrates that you can eat the most of without gaining weight are … unsurprisingly … vegetables!